Standard PC keyboards have three visual indicators for Num lock, Caps lock and Scroll lock states. That way it is possible to see the state of the three locks immediately and react if they are not set correctly. The most used locks of the three is probably the Num lock state, which turns the numeric keypad on and off on the keyboard. Less useful and probably not used at all by most computer users are the Caps lock and scroll lock keys. Especially the wrong caps lock state can be problematic. Back when i worked in the IT of a big corp we had lots of users who locked themselves out of the system by entering the wrong password because the Caps lock key was active. Experienced users may have spotted the wrong state of the caps lock key eventually, if they were not working on a laptop or another mobile device. The majority of laptops does not have indicators for these three system states on the keyboard, which means that it becomes harder to find out in which state the keys are. Unless of course, the user has installed a program like Keyboard Leds. The software program acts as a substitute for the keys on the keyboard. It displays the states of the num, caps and scroll lock key in the system tray, and if desired, as an on screen display as well. Each led can be configured individually. Windows users who only want to see the state of the caps lock key can for instance disable the two other keys. It is also possible to change the color indicator for each key. The on screen display offers a slightly different approach. It displays textual information about each key's state, with options to drag and drop the display to any area on the screen, and to change the text color and size, as well as the background color. 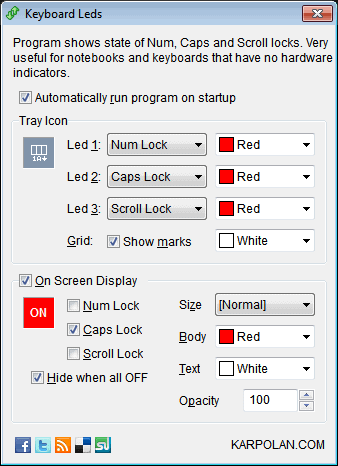 Keyboard Leds is a handy tool for laptop users (and Windows users with broken Leds) who want to have access to caps, num and scroll lock state indicators on the system. The free program is compatible with 32-bit and 64-bit editions of Windows, and available for download at the developer website.